Creation of a program with interactive content and time-based media would be improved by having several people working simultaneously on both the interactive content and the time-based media. The range of types of data that can be associated with the time-based media also can include a variety of types of content that enhance the time-based media, including data that is opaque to the editing system. To support editing of such programs, enhanced content may be edited into a program as either a clip or a locator, according to a user's selection. The components that represent enhanced content also may be edited in the same way as components that represent time-based media. Enhanced content may be represented by enhancement files that include data defining enhancements. An enhancement includes an identifier of the enhancement within the enhancement file, and a reference to a file defining enhanced content associated with the enhancement. Such enhancement files may be imported into a bin of an editing system to create components that describe the enhanced content referenced by the enhancements. The enhanced content may be modified using native applications for the enhanced content during editing of the program. The components describing the enhanced content in the editing system can be updated using identifiers of the enhanced content that are stored by the components. Enhanced content also may be automatically synchronized with time-based media. This application claims the benefit under 35 U.S.C.§120, and is a continuing application, of U.S. patent application Ser. No. 09/838,782, filed Apr. 20, 2001, now pending. In another aspect, an editing system displays a timeline representing a program. The timeline may include at least one track for enhanced content and at least one track for time-based media. Using the timeline, enhanced content may be associated with a position in time on the timeline and time-based media may be associated with a position in time on the timeline. A user is allowed to relate enhanced content and time-based media to create auto-synchronized content. The user is allowed to place a component representing the auto-synchronized content at a position in time on the timeline. The enhanced content of the auto-synchronized content may be placed on the at least one enhanced content track and the time-based media of the auto-synchronized content may be placed on the at least one time-based media track. The auto-synchronized content represented by the component is associated with the position in time in the program. A user then can perform editing operations on the time-based media of the auto-synchronized content on the timeline such that the editing operations are also performed on the enhanced content of the auto-synchronized content. FIG. 5 is a flowchart describing how enhanced content may be refreshed. The user interface in FIG. 1 includes a source window  100 for displaying source media and a record window 102 for displaying an edited program. Video may be displayed in the record window 102 or in a region 104 of the record window 102. The region 104 may be specified by an indication of the size of the video with respect to the associated enhanced content, as described in more detail below, providing a picture-in-picture effect. The region 104 also may display video as a background on which associated enhanced content is overlaid. Other information also could be used to specify a layout of the video and the enhanced content to be viewed in the record window 102. A timeline interface  106 represents the edited program, and includes one or more enhanced content tracks 112 and one or more time-based media tracks, such as one or more video tracks 108 and one or more audio tracks 110. A track has an associated edit rate or temporal resolution in which positions in time are represented. For example, all tracks may have the same edit rate, which may be determined by the edit rate of a primary video track. In general, to associate time-based media with a position in time on the timeline interface, a user may select from among components representing sources of time-based media from one or more bins. Time-based media represented by a selected component may be viewed in the source window  100. The user may select in and out points in the time-based media source viewed in the source window to designate a component, called a clip, which may be added to a sequence of clips on the time-based media track in the timeline interface 106. To associate enhanced content with a position in time on the timeline interface, a user may select from among components representing enhanced content from the one or more bins. Information associated with a selected component may be viewed in the source window  100 or in a separate viewing application for the enhanced content, depending on the type of the enhanced content represented by the component and the capabilities of the editing system. The user may select an enhanced content track 112 and a position in time in the track at which the component should be added. The component may be added at a point in time, using a component called a locator 114 (described below), or may be added over a range of time or duration, using a component called a source clip 116 (described below). Time-based media also may be represented using source clips and locators. A user may be prompted by the editing system for a selection of either a point in time or a duration to which the enhanced content is associated. The information describing enhanced content from an enhancement file may be stored by a component in a bin by importing the enhancement file into an editing system. A component in the bin may include information such as shown in FIG. 2A. In particular, an indication of a type of the enhanced content  200 may be provided if numerous types of enhanced content are supported. A locator 201, such as a uniform resource locator (URL) or other file name, may be used to indicate a file that defines the enhanced content. 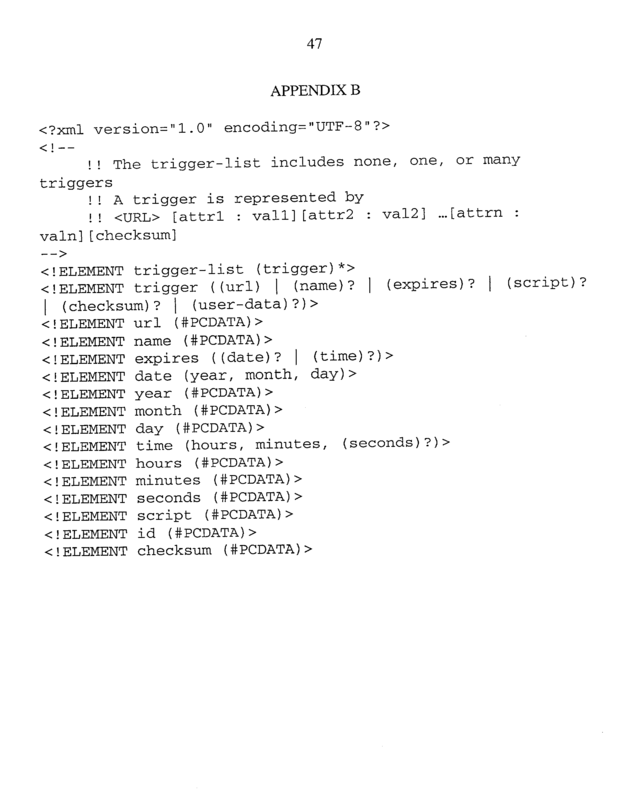 An indication of an application 202, which may be a script for a trigger, such as a Java script program or other computer program code to be executed, may be included. A name 204 also may be stored. This name field may be used as a name or as a readable text description of the enhanced content. Expiration information 206, such as a date and time, and expiration type 208 (indicating whether the expiration information indicates a duration of time the trigger is valid or a time at which the trigger expires) also may be provided for triggers. An identifier field 210 stores the identifier of the enhancement that describes the enhanced content, which may include a reference to the enhancement file. 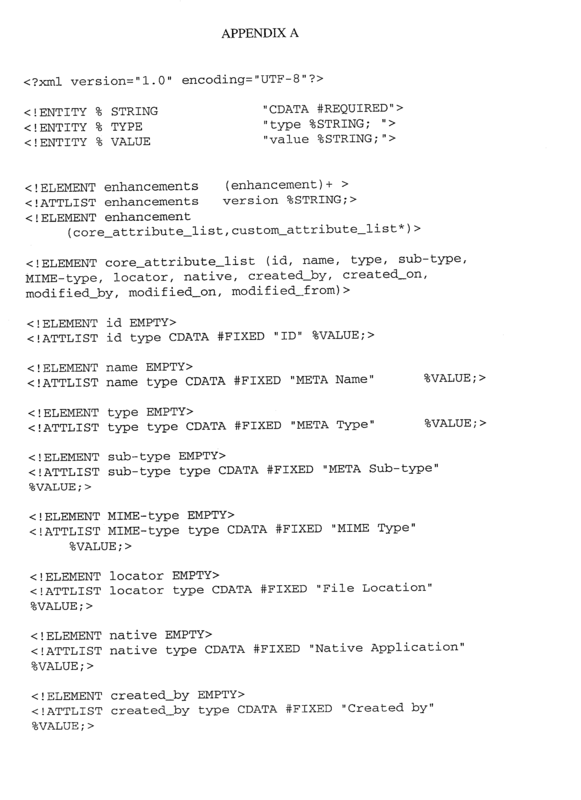 One or more additional fields 212 may be used to store other data such as user defined data, custom attributes, modification and creation dates and user information, or other information described by an enhancement in the enhancement file. A checksum 214 may be included to allow detection of corrupted data. If the enhanced content is defined by a file for which an image can be created, such as a URL that references an HTML document, information such as shown in FIG. 2B may describe the enhanced content further. This information may include a snapshot  220 of the file. For example, if the file is a document retrieved from a URL, the document may be processed by a browser to generate a snapshot. Any related files 222 (such as linked files), and any indication of cropping 224, scaling 226 or overlay 228 of the associated video on the video track, and the dimensions and position 230 of the video with respect to the snapshot also may be stored. The dimensions 232 of the snapshot also may be obtained and stored. Whether the snapshot is to be overlaid on the video or whether the video is to be displayed within the snapshot as a picture in picture or other layout information 234 also may be specified. The information shown in FIG. 2B also is an example of additional kinds of information that may be used to represent interactive content, such as a document in a markup language such as the hypertext markup language (HTML) or XML. The process of importing enhanced content into a bin using an enhancement file will now be described in connection with FIG. 3A. A user first identifies  300 an enhancement file using any conventional technique to locate the file. An import operation is then invoked 302. The import operation reads 304 the enhancement file to access the data defining one or more enhancements in the enhancement file. 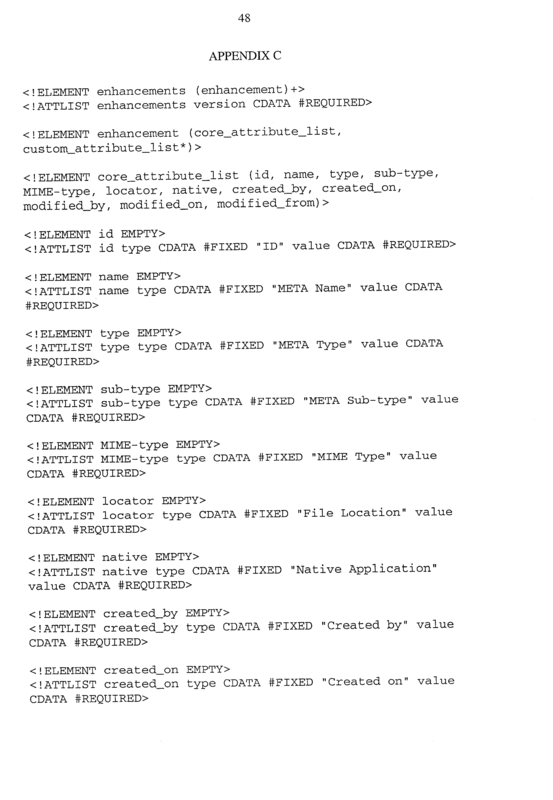 After data defining the enhancement is read, a component is created 306 in the bin, with attributes that store information describing the enhanced content. How the data defining the enhancement is used to create a component in the bin may depend on the type of the enhanced content. The attributes that are stored may include the name of the enhancement file storing the enhancement and the identifier of the enhancement in that enhancement file. The attributes that are stored may include a reference to the file defining the enhanced content associated with the enhancement. A reference to a native application for the file also may be stored. A component so created also may have its own unique identifier assigned by the editing application, which is different from the identifier of the corresponding enhancement. How an enhancement is processed to define a component in the bin may depend on the type of the enhanced content. As an example, if the enhanced content is interactive content, and more particularly a trigger, then (referring now to FIG. 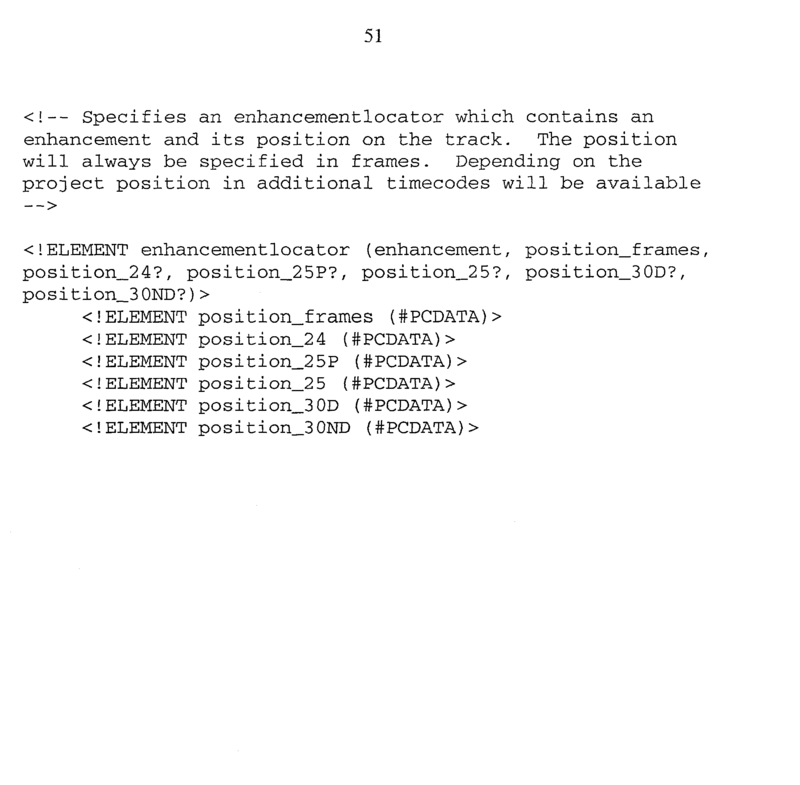 3B) the enhancement is located  310 in the enhancement file. The file defining the trigger that is referenced by the enhancement is accessed 312 to obtain the information described in FIG. 2B. In particular, any “TV:” element or other element in the specified file that specifies the dimension and position of the video and its relationship to the enhanced content and is read to obtain appropriate values. A snapshot of the document defined by the specified file may be generated 314 by applying the document to a conventional browser object and storing the output from the browser object as an image file. The browser object may be instructed to use a background of a unique color, such as green or blue as is commonly used in blue screen and green screen special effects to allow the HTML data to be overlaid on the video using a chroma key operation. A reference to the snapshot may be stored 316 as an attribute of the component in the bin. It is possible to access and process the entire specified file and files referenced within the specified file for later use. Referenced files might be imported to protect against subsequent unavailability of the specified file or referenced files. Whether the import process includes capturing of HTML data referenced by the URL  200, or the files referred to by the document at the URL 200 may be at the user's selection through an appropriate user interface. It is also possible to import only the HTML data (or other information) for interactive content that is not a trigger. For example, a document in a markup language may be accessed through conventional techniques for locating its file. Files accessed in this manner include any files referenced by a file referenced by a trigger. The file then may be read to extract information that is stored as an attribute of a component in the bin. After enhanced content is imported into a bin, a user may access components representing the enhanced content in the bin using the editing application. Components representing time-based media also may be in a bin. One or more bins may be provided. Separate bins may be provided for different types of content, or a bin may include content of mixed types. Components in a bin may be selected, optionally viewed in a source viewer depending on the type, and added to a timeline. Addition of components to a timeline may be limited to a designated track (e.g., enhanced content may be limited to the enhanced content track  112 in FIG. 1). On an enhanced content track, enhanced content may be added as one of a number of types of components, such as a source clip or a locator. Enhanced content may be added as a locator on tracks other than the enhanced content track. The information describing the enhanced content is stored as attributes on either the source clip or locator. For triggers, a trigger clip in a bin appears as a locator on the timeline, and the attributes of the trigger clip are transferred to the locator. An HTML clip in a bin appears as a source clip on the timeline, and its attributes are transferred to the source clip. A linked trigger clip and other components representing enhanced content in a bin may appear, upon a user's selection, as either a source clip or a locator on a timeline. The user's selection may be obtained through any appropriate user interface. Referring now to FIG. 4, an example system for simultaneous authoring of time-based and enhanced content for a program is described. In this example, enhancement files  408 may be created and modified by the enhancement application 402, described above, and stored on shared storage 400. Such shared storage may be a computer network, a shared file system, a distributed file system, a set of file servers or any other mechanism to share information between the systems. The enhancement application 402 uses a reference to the enhancement file, such as the file name, and an identifier 406 of an enhancement to access the shared storage for reading and/or writing of data defining enhancements in enhancement files 408. Enhancements may refer to content files 410 and 412 that are stored on the shared storage 400 or some other location. These content files may be created and modified using a variety of native applications 414 and 416. The native applications may be, for example, content authoring tools, or a database application, a script writing program, or any other application that creates a file defining enhanced content. An editing application 404, such as described above in connection with FIGS. 1-3, may be used to create and modify the program by combining time-based media and enhanced content in the manner described above. Enhanced content 418 may be imported into a bin for the editing application 404 using enhancement files 408 and content files 410, 412, to create components that may be selected for insertion into the program. An identifier 420 for the enhanced content 418, such as a reference to the enhancement file 408 and an identifier for the enhancement describing the enhanced content, or other identifier, such as a reference to a file defining the enhanced content, may be used by the editing application to access the enhanced content 418. The editing application also may be programmed to launch a native application  414, 416 associated with an enhanced content that is stored in a bin or that is placed on an enhanced content track. For example, the editing application may be programmed to allow a user to use any conventional operation to select the enhanced content that is in the bin or on the enhanced content track. The editing application then can cause the associated native application to launch, access and open for editing the enhanced content associated with the component that is in the bin or on the enhanced content track. With such a system, multiple editors may be working on different parts of a program at one time. Thus, enhanced content files  410 and 412 or enhancement files, or enhancements within them, may change after they are imported into a bin of the editing application 404. However, the unique references for the enhanced content in the bin, e.g., the enhancement file name and identifier for an enhancement or a reference to a file defining the enhanced content, may be used to obtain updated enhanced content from its source. This updating process is called a refresh operation. The refresh operation is similar to an import operation except for the method of identification of the enhancement file. In a refresh operation, information describing the enhanced content that has been selected for refresh is extracted from currently available sources that correspond to the identifiers associated with the enhanced content, e.g., the identifier for an enhancement or the reference to a file defining the enhanced content. Referring to FIG. 5, to perform a refresh operation on enhanced content, the user may select  500 one or more components in the bin to be refreshed, for example by selecting a particular component, components that reference the same identifier, or components on a track or components in a bin. One of the selected components is selected 502. The name of the enhancement file and the identifier of the enhancement for the selected components are used to locate 504 the enhancement file from the shared storage (400 in FIG. 4). The enhancement is then imported 506 in the same manner as described above in connection with FIGS. 3A and 3B. If no components remain to be refreshed, as determined in 508, the refresh operation is complete, otherwise, the next component of the selected components is then selected 502 and the steps 502-508 are repeated. Similar operations also can be performed on other enhanced content using an identifier, e.g., a URL or other reference to a file that defines the enhanced content. a user interface for allowing a user to place a component representing enhanced content at a position in time on the timeline according to a selection of either a point in time or a duration on the timeline, such that the enhanced content represented by the component is associated with the point in time or the duration in the program according to the selection and an indication of the component is displayed on the timeline according to the selection. 2. The editing system of claim 1, wherein the timeline includes at least one track for enhanced content and at least one track for time-based media. 3. The editing system of claim 1, wherein the component representing enhanced content is placed on the timeline at a point in time using a locator component. 4. The editing system of claim 1, wherein the component representing enhanced content is placed on the timeline with a duration using a source clip component. 5. 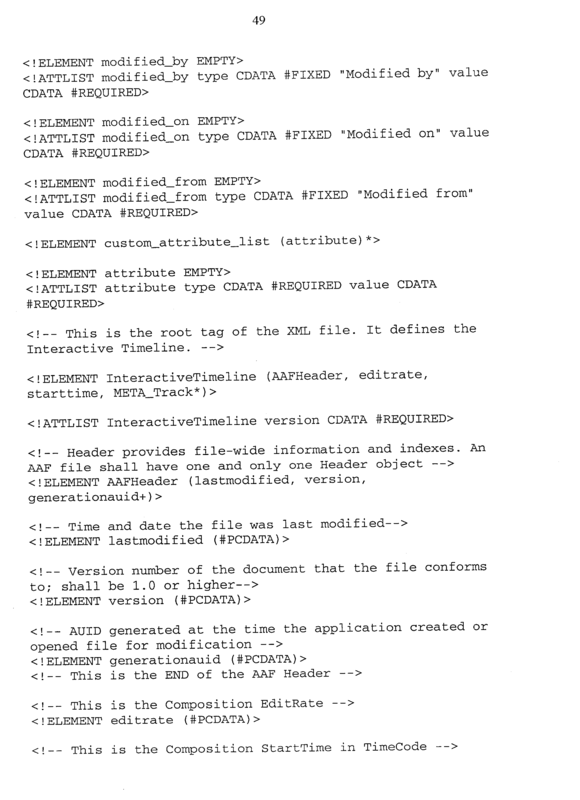 The editing system of claim 1, wherein the component representing enhanced content on the timeline includes a field for storing a reference to a file defining the enhanced content. 6. The editing system of claim 5, wherein the component representing enhanced content on the timeline includes a field for storing a reference to a native application capable of processing the enhanced content. 7. The editing system of claim 5, wherein a native application capable of processing the enhanced content is determined according to the file defining the enhanced content. means for allowing a user to place a component representing time-based media at a position on the timeline, wherein the component has a duration. 9. The editing system of claim 8, wherein the component representing time-based media is placed on the timeline with the duration using a source clip component. 10. The editing system of claim 9, wherein the component representing enhanced content is placed on the timeline with a duration using a source clip component. 11. The editing system of claim 8, wherein the component representing time-based media on the timeline includes a reference to a file for storing the time-based media and a range within the stored time-based media. means for allowing a user to place a component representing time-based media at a position on the timeline, wherein the component has a point in time on the timeline. 13. The editing system of claim 12, wherein the component representing time-based media is placed on the timeline at the point in time using a locator component. 14. The editing system of claim 13, wherein the component representing enhanced content is placed on the timeline at a point in time using a locator component. 15. The editing system of claim 1, wherein the means for allowing includes means for prompting a user for the selection. 16. The editing system of claim 1, wherein enhanced content comprises nontemporal media data. 17. The editing system of claim 1, wherein enhanced content comprises data that is not processed natively by the editing system. 18. The editing system of claim 1, wherein enhanced content comprises interactive content having a time during the program that results in content being perceived during playback of the program. 19. The editing system of claim 18, wherein the interactive content comprises a document defined in a markup language. 22. The editing system of claim 18, wherein the interactive content comprises a trigger that stores an indication of an operation to be initiated at a point in time during playback of time-based media. 23. The editing system of claim 22, wherein the operation comprises displaying data. 24. The editing system of claim 22, wherein the operation comprises sending control signals to a device. 25. The editing system of claim 22, wherein the trigger also comprises information about the size, position or orientation of display of time-based media associated with the trigger. 26. The editing system of claim 1, wherein enhanced content comprises data that is opaque to the editing system. 27. The editing system of claim 26, wherein the opaque enhanced content uses an application other than the editing system for viewing the enhanced content. 28. The editing system of claim 26, wherein the opaque enhanced content uses an application other than the editing system for editing the enhanced content. 29. The editing system of claim 26, wherein the opaque enhanced content is not perceived as part of the program by the user during playback of the program in the editing system. 30. The editing system of claim 26, wherein the opaque enhanced content supplies information to create the program. 31. The editing system of claim 26, wherein the opaque enhanced content tracks information about the program. allowing a user to place a component representing enhanced content at a position in time on the timeline according to a selection of either a point in time or a duration on the timeline, such that the enhanced content represented by the component is associated with the point in time or the duration in the program according to the selection and an indication of the component is displayed on the timeline according to the selection. means for allowing the user to perform editing operations on the timeline that affect temporal properties of components on the timeline, wherein the editing operations process components representing enhanced content and components representing time-based media in the same manner. 35. The editing system of claim 34, wherein the timeline includes at least one track for enhanced content and at least one track for time-based media. 36. The editing system of claim 34, wherein the time-based media represented by the component is associated with the position in time in the program and the component representing the time-based media is displayed on the timeline according to the position in time. 37. The editing system of claim 34, wherein the enhanced content represented by the component is associated with the position in time in the program and the component is representing the enhanced content is displayed on the timeline according to the position in time. means for allowing the user to place the component representing enhanced content at the position in time on the timeline according to a selection of either a point in time or a duration on the timeline, such that the enhanced content represented by the component is associated with the point in time or the duration in the program according to the selection and an indication of the component is displayed on the timeline according to the selection. 39. The editing system of claim 38, wherein the component representing enhanced content is placed on the timeline at a point in time using a locator component. 40. The editing system of claim 38, wherein the component representing enhanced content is placed on the timeline with a duration using a source clip component. 41. The editing system of claim 34, wherein the component representing enhanced content on the timeline includes a reference to a native application capable of processing the enhanced content. 42. The editing system of claim 34, wherein the component representing time-based media is placed on the timeline with a duration using a source clip component. 43. The editing system of claim 42, wherein the component representing enhanced content is placed on the timeline with a duration using a source clip component. 44. The editing system of claim 34, wherein the component representing time-based media is placed on the timeline at the point in time using a locator component. 45. The editing system of claim 44, wherein the component representing enhanced content is placed on the timeline at a point in time using a locator component. 46. The editing system of claim 34, wherein the component representing enhanced content has a type and wherein the editing system includes means for processing a component representing enhanced content according to the type. 47. The editing system of claim 46, wherein if the type of the component is a trigger, then the means for processing the component includes means for specifying a display region for video and a display region for enhanced content represented by the component. 48. The editing system of claim 46, wherein if the type of the component is opaque, then the means for processing the component includes means for identifying a native application for the referenced file and executing the native application to permit access to the referenced file. 49. 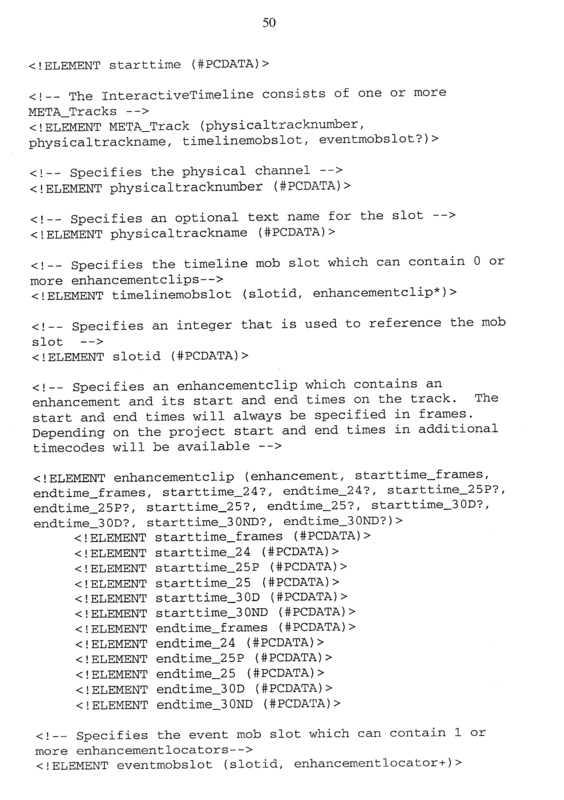 The editing system of claim 34, wherein the component representing enhanced content and the component representing time-based media are instances of subclasses of an object class for which the editing operations are implemented. 50. The editing system of claim 34, wherein the component representing enhanced content and the component representing time-based media are instances of the same object class for which the editing operations are implemented. 51. The editing system of claim 34, wherein the component representing enhanced content and the component representing time-based media are implemented using the same type of component for which the editing operations are defined. 52. The editing system of claim 34, wherein the editing operations include trim operations. 53. The editing system of claim 34, wherein the editing operations include slip operations. 54. The editing system of claim 34, wherein the editing operations include slide operations. 55. The editing system of claim 34, wherein the editing operations include cut operations. 56. The editing system of claim 34, wherein the editing operations include lift operations. 57. The editing system of claim 34, wherein the editing operations include overwrite operations. 58. The editing system of claim 34, wherein the editing operations include splice operations. 59. The editing system of claim 34, wherein the editing operations include auto-synchronization operations. allowing the user to perform editing operations on the timeline that affect temporal properties of components on the timeline, wherein the editing operations process components representing enhanced content and components representing time-based media in the same manner. for each enhancement, creating a component in the bin of the editing system, wherein the component includes information describing the enhanced content. 63. The method of claim 62, wherein the information describing the enhanced content comprises a reference to the enhancement file and the identifier of the enhancement. 64. The method of claim 63, wherein the information describing the enhanced content comprises the reference to the file defining the enhanced content associated with the enhancement. 65. The method of claim 64, wherein the information describing the enhanced content comprises an identifier of a native application for processing the file defining the enhanced content associated with the enhancement. 66. The method of claim 65, wherein the information describing the enhanced content comprises a type of the enhancement. 67. The method of claim 66, wherein the information describing the enhanced content comprises custom attributes for the enhancement. 68. The method of claim 62, wherein the information describing the enhanced content comprises the reference to the file defining the enhanced content associated with the enhancement. 69. The method of claim 68, wherein the information describing the enhanced content comprises an identifier of a native application for processing the file defining the enhanced content associated with the enhancement. 70. The method of claim 69, wherein the information describing the enhanced content comprises a type of the enhancement. 71. The method of claim 70, wherein the information describing the enhanced content comprises custom attributes for the enhancement. 72. The method of claim 62, wherein the information describing the enhanced content comprises a type of the enhancement. 73. The method of claim 62, wherein the information describing the enhanced content comprises custom attributes for the enhancement. means for creating, for each enhancement, a component in the bin of the editing system, wherein the component includes information describing the enhanced content. a reference to a file defining enhanced content associated with the enhancement. an identifier of a native application for processing the file defining the enhanced content. a type indicating a type of the enhancement. one or more custom attributes for the enhancement. 84. The digital information product of claim 76, wherein the one or more enhancements comprises a list of enhancements. a reference to data in the markup language document defining an enhancement that describes the enhanced content represented by the component. 93. The method of claim 92, wherein the start position is specified in a plurality of time code formats. 94. The method of claim 93, wherein the end position is specified in a plurality of time code formats. 95. The method of claim 94, wherein the plurality of time code formats includes 24 frames per second, 25 frames per second and 30 frames per second. a reference to a file defining the enhanced content associated with the enhancement. a reference to each element in the markup language document that describes a component representing enhanced content on the identified track for enhanced content. means for updating the information describing the enhanced content related to a component in the bin using the identifier associated with the enhanced content. 108. The editing system of claim 107, wherein the timeline includes at least one track for enhanced content and at least one track for time-based media. 109. 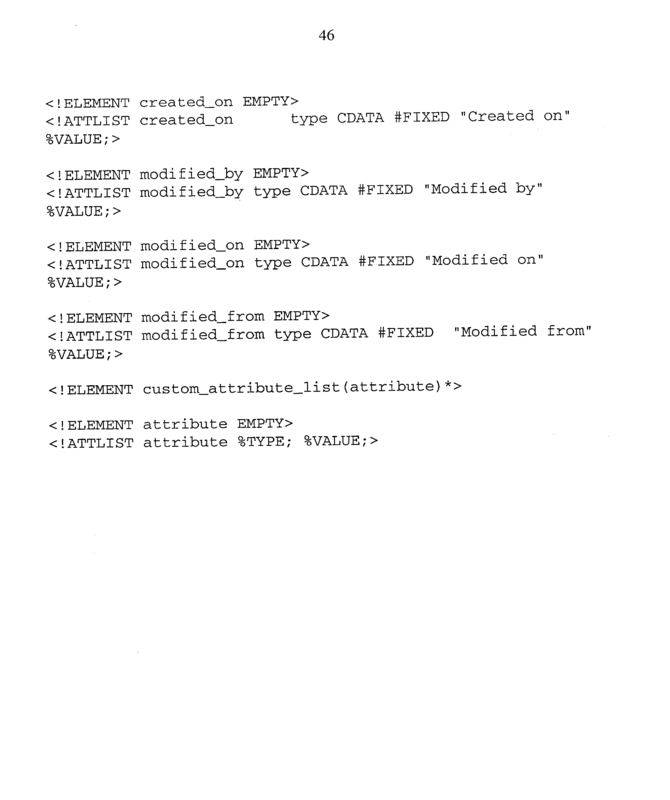 The editing system of claim 107, wherein the identifier includes a reference to an enhancement file including data defining one or more enhancements, wherein an enhancement describes the enhanced content, and wherein the identifier includes an identifier of the enhancement in the enhancement file. 110. The editing system of claim 109, wherein the information describing the enhanced content comprises a reference to a file defining the enhanced content. 111. The editing system of claim 110, wherein the information describing the enhanced content comprises an identifier of a native application for processing the file defining the enhanced content. 112. The editing system of claim 111, wherein the information describing the enhanced content comprises a type. 113. The editing system of claim 112, wherein the information describing the enhanced content comprises custom attributes. 114. The editing system of claim 107, wherein the information describing the enhanced content comprises a reference to a file defining the enhanced content. 115. The editing system of claim 114, wherein the information describing the enhanced content comprises an identifier of a native application for processing the file defining the enhanced content. 116. The editing system of claim 115, wherein the information describing the enhanced content comprises a type. 117. The editing system of claim 116, wherein the information describing the enhanced content comprises custom attributes. 118. The editing system of claim 107, wherein the information describing the enhanced content comprises a type. 119. The editing system of claim 118, wherein the information describing the enhanced content comprises custom attributes. updating the information describing the enhanced content related to a component in the bin using the identifier associated with the enhanced content. means for allowing a user to perform editing operations on the time-based media of the auto-synchronized content on the timeline such that the editing operations are also performed on the enhanced content of the auto-synchronized content. 123. The editing system of claim 122, wherein the timeline includes at least one track for enhanced content and at least one track for time-based media. 125. The editing system of claim 122, wherein enhanced content comprises nontemporal media data. 126. The editing system of claim 122, wherein enhanced content comprises data that is not processed natively by the editing system. 127. The editing system of claim 122, wherein enhanced content comprises interactive content having a time during the program that results in content being perceived during playback of the program. 128. The editing system of claim 122, wherein enhanced content comprises data that is opaque to the editing system. 129. The editing system of claim 128, wherein the opaque enhanced content uses an application other than the editing system for viewing the enhanced content. 130. The editing system of claim 128, wherein the opaque enhanced content uses an application other than the editing system for editing the enhanced content. 131. The editing system of claim 128, wherein the opaque enhanced content is not perceived as part of the program by the user during playback of the program in the editing system. 132. The editing system of claim 128, wherein the opaque enhanced content supplies information to create the program. 133. The editing system of claim 128, wherein the opaque enhanced content tracks information about the program.